What do you mean by mixed-gender mentoring pairs? Mixed-gender mentoring pairs are male-female/female-male mentoring pairs, where one person identifies as male and the other as female. Either gender can be the mentor with the opposite gender being the mentee. 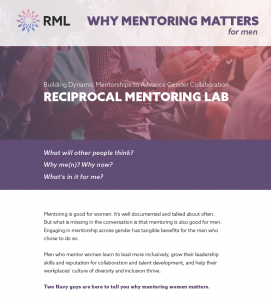 Since the work we focus on develops skills across gender, the RML is not intended for same-gender mentoring pairs. We recognize that gender is a fluid construct and we do not intend to oversimplify it. Gender is complex and we have intentionally chosen it as one way to explore some of the challenges that mentors and mentees encounter. Futhermore, the RML works with gender as a lens that can lead to greater conversations about intersectionality and the qualities that make each of us unique. At what leadership or seniority level should the mentoring pairs be? The RML is designed for experienced leaders that are at a director level and above. The mentee should have people directly reporting to them, and their mentor should be at least 1+ level above them within their organizational structure. Do the mentoring pairs need to be existing or new pairs? The mentoring pairs can be either newly formed or established mentoring relationships. Existing pairs do bring experience and their own developed point of view which can add to the learning that takes place. 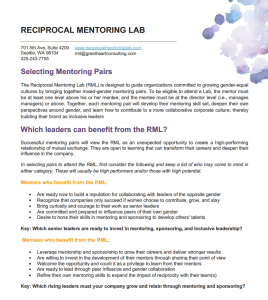 If you or your organization needs help finding mentoring pairs, please see our guide on how to select a mentoring pair. 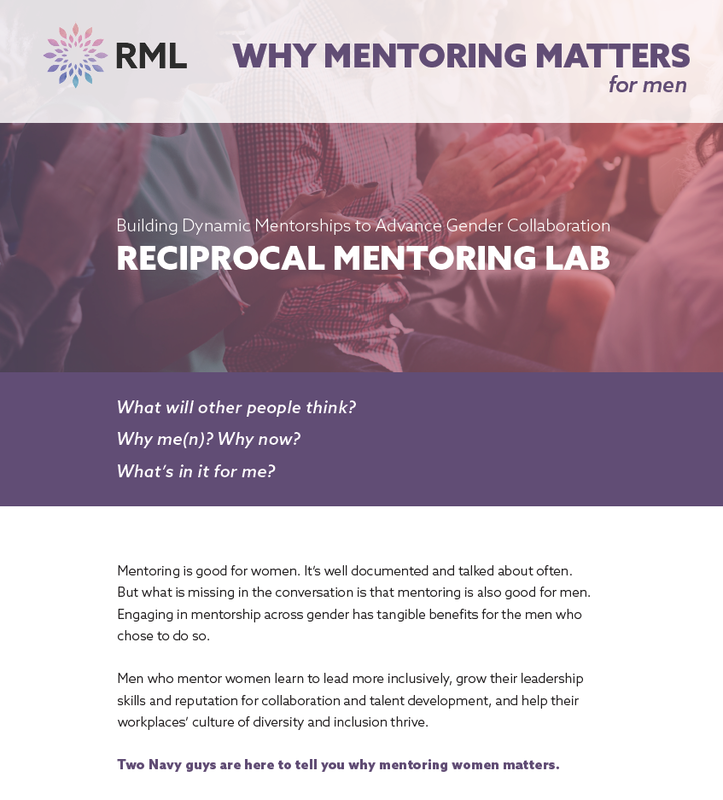 Each RML is designed for up to 35 mentoring pairs. Usually, up to eight mentoring pairs can attend a single open enrollment session from one company. If you would like more mentoring pairs to attend, please contact us. Beyond Open Enrollment Labs, we also offer Metro Sponsored (co-sponsored by a corporate partner), and Client Based Labs (held entirely within your organization). For more information about these solutions, email us at rml@greatheartconsulting.com. "By investing in mixed-gender mentoring relationships, companies can take a step towards creating a more inclusive culture where both men and women lead." What's included in the RML experience? The RML is an immersive learning experience that begins when you sign up. Before the workshop, you will be introduced to world-class faculty through a webinar, complete a online mentoring assessment, and engage in a discussion with your mentor or mentee. During the two-day in person workshop, you will meet with other inclusive leaders and be led by faculty through various discussions and skill building exercises. 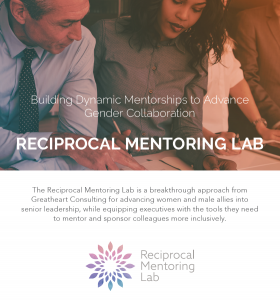 After the workshop, with access to additional resources including follow-up mentoring assessments and a webinar, you will be equipped to apply your learning to expand the mentoring relationship and help your organization build a more inclusive culture. My city doesn't have a RML scheduled. How can I bring the Lab to my city? We are excited that you want RML in your city! Let us know that you'd like the Lab to come to your region in the questions/comments section and sign up to receive updates on new RML events. Can my company host the RML internally? 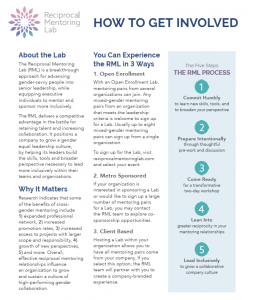 If your organization wants to leverage the RML to advance and retain rising women leaders while equipping all individuals to mentor and sponsor more inclusively right now, consider hosting a Lab internally. If interested, please contact the RML team at rml@greatheartconsulting.com or by reaching us through the form at the bottom of this page. How can my company co-sponsor the Lab? 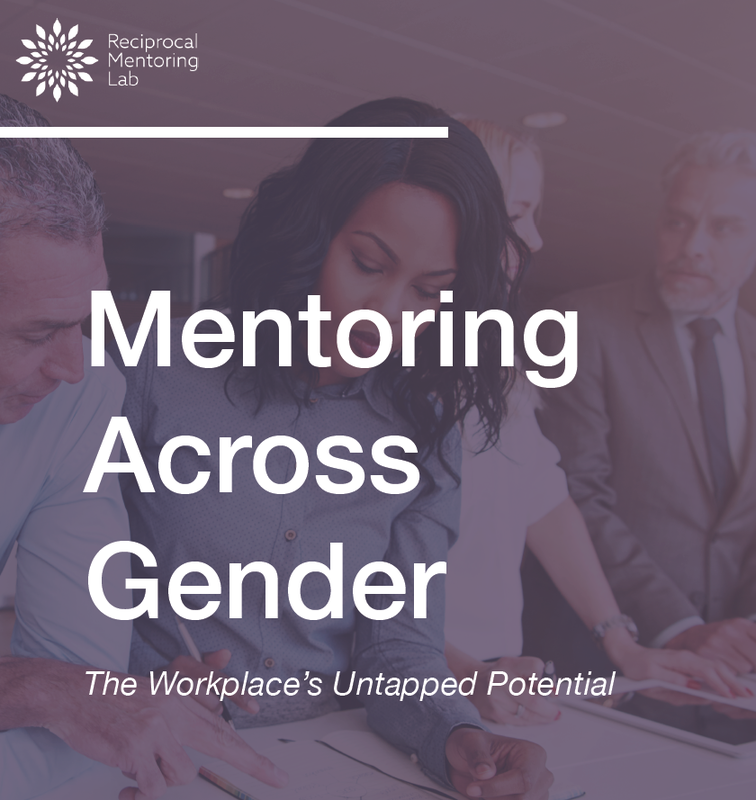 If there are several pairs from your organization that would like to attend the Lab, you can use this opportunity to demonstrate your commitment to advancing and retaining talented women by investing in a more inclusive culture for all. If you are interested in sponsoring a Lab, please contact the RML team at rml@greatheartconsulting.com or by reaching us through the form at the bottom of this page. Learn more about this innovative program. A quick guide to selecting these high-performing pairs. A guide for executive men by two of our faculty. Why now is the perfect time to do this important work and why you shouldn't miss this opportunity to do it! 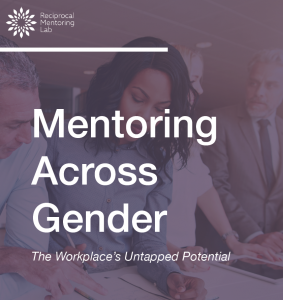 An introduction to the Lab and ways to participate in its groundbreaking approach to mentoring across gender.